If you are new to the state of New Mexico, or if you have simply yet to have your VIN inspected by a trained professional, the friendly professionals at MVD Express are here to help! In today’s article, we will be talking more about how easy it is to get your VIN inspected at your nearby MVD Express, or by making an appointment for one of our trained professionals to visit you! Once you’re done reading, be sure to schedule your appointment by visiting our website or calling us at 505-226-9333! At MVD Express, we are New Mexico’s top-rated business offering the leading MVD services in a fast and friendly manner. With 10 unique locations throughout The Land of Enchantment, we make it easier than ever for you to find the best MVD services in your area. From motorcycle license tests and license renewals to paying for traffic citations, we continue to offer the widest selection of MVD services and we are staffed by a team of friendly representatives. 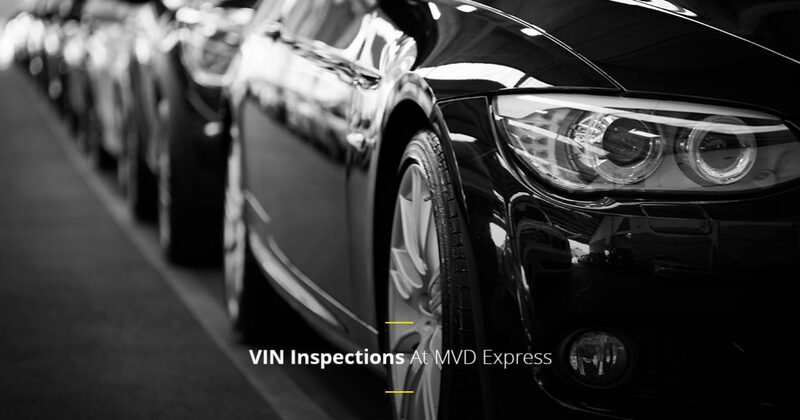 Learn more about VIN inspections today with MVD Express! Why Do I Need A VIN Inspection? According to New Mexico state law, all vehicles coming to New Mexico from another state must have their VIN inspected by a certified MVD agent. This process is to verify that the car in question belongs to you, and works to cut back on the number of stolen vehicles present in New Mexico. To learn more about the VIN inspection process, simply visit our website, or call our team of representatives at 505-226-9333. Where Can I Get A VIN Inspection In New Mexico? We know that no two individuals’ schedules are the same, that’s why we do everything possible to ensure that all residents of New Mexico can schedule a VIN inspection that aligns with their busy schedule. So whether you would like to schedule your VIN inspection at your local MVD Express, or you would like to schedule a VIN Inspection in another location, we are more than happy to accommodate your needs. In fact, as part of our commitment to offer the most in value to our customers, we will come to your location of choice to verify your VIN, so that you can worry less about visiting your MVD and more about taking care of your day-to-day priorities. We do this all so that you can Get In, Get Done, and Get Going! We hope that you enjoyed learning about the VIN inspection process, and just how easy it is to schedule your VIN inspection with the professionals at MVD Express. To view current wait times for any of our locations, or to schedule an appointment for any of our offered services, then consider visiting our website today! If you have any questions or concerns about the process, or if you would simply like to learn more about our full offering of MVD services, then don’t hesitate to reach out to our friendly team members. We work hard to respond to all inquiries in a timely manner, and we look forward to speaking with you!